Let's first discuss the beer first before getting to the fireworks (pun intended...you'll see why later). 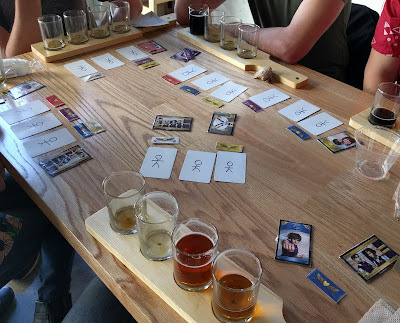 Anyway, we went to Three Weavers Brewing Company in Inglewood, California, which is a newer brewery in LA (2013). Three Weavers claims to be "deeply rooted in the concept of responsibility - to our environment, to our industry, to our community, and to our employees. Three Weavers exists to share our love and appreciation of beer with the world - join us and become a member of the family." Now if that didn't sell you on visiting, the IPAs will. Overall the brewery has a pretty decent beer selection, around 5 year-round beers and 5 rotating specials, both of which you can order in flights to taste them all. Their best beer is probably their Expatriate IPA, so I highly recommend it if you visit. 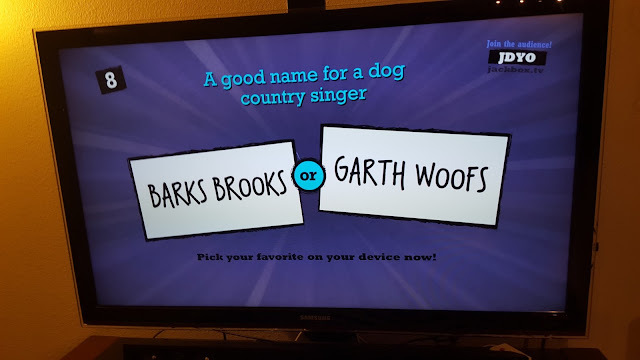 How did we pass the time you ask? Hanabi! 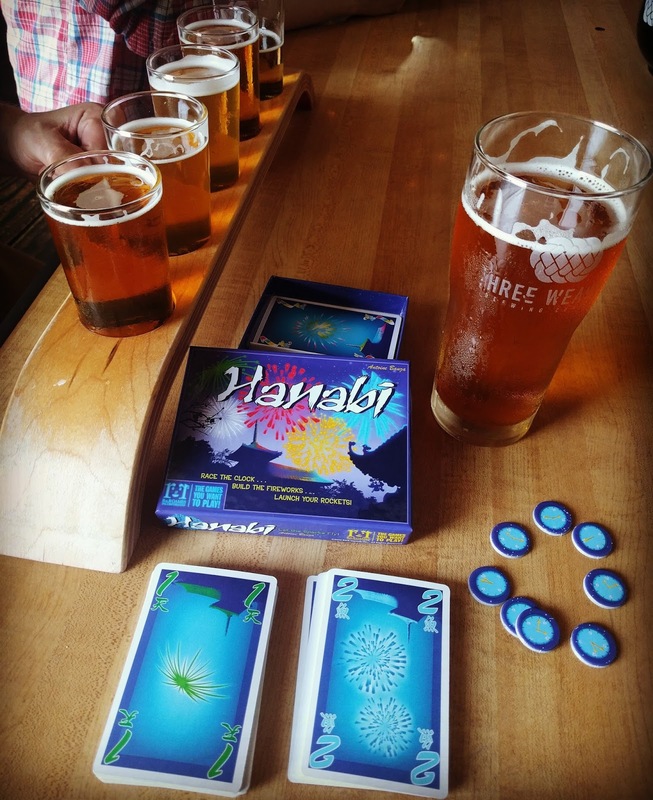 Hanabi is named for the Japanese word for "fireworks" and is a unique, cooperative game in which players try to create the perfect fireworks show by placing the cards on the table in the right order. The card deck consists of five different colors of cards, numbered 1–5 in each color. For each color, the players try to place a row in the correct order from 1–5. Sounds easy, right? Well, not quite, as in this game you hold your cards so that they're only visible to other players (meaning you can't see your own cards the entire game!). To assist other players in playing a card, you must give them hints regarding the numbers or the colors of their cards. Players must act as a team to avoid errors and to finish the fireworks display before they run out of cards. 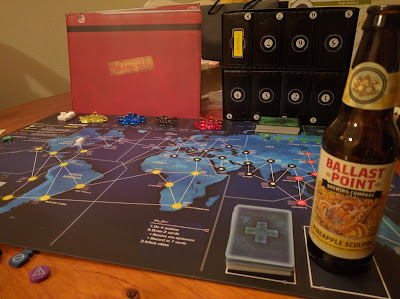 This game is a blast, simple to learn, but depth for days. It's so good that it won the Spiel des Jahres Award in 2013. If you don't know what that means, it's the award for German Game of the Year and you can read more here. Update as I'm writing this: Code Names just won the Spiel des Jahres for 2016. There are so many great games out there! Hanabi is only $10 on Amazon. Therefore, you have no excuse for not buying it. Do it now!